It was complicated. Three hundred pieces cut in the oddest shapes I’d ever seen for a puzzle. Some I swore were edge pieces and for a while was frustrated that they weren’t fitting into the frame with the other edge pieces. If you’re like me, you put the edges together first, then work on the various sections that appear to go together, carefully studying the full image to navigate through the picture. But not everyone does it that way. Still, I derive no satisfaction from her methodology. I prefer studying the image on the box top, absorbing its wholeness, beauty and nuances. I hold pieces up to it, attempt to match the color and then estimate the piece’s location in the enlarged frame on the table. I relish the mounting anticipation of accomplishment as each piece clicks perfectly into its proper place, revealing increasingly more of the final picture. This particular puzzle, however, was disturbing. As I said, pieces were not cut in the traditional shapes and so it wasn’t as enjoyable. Many pieces simply rested next to each other without hooking. And, when I’d match up those non-hooked pieces, I didn’t feel the same satisfaction. It was almost as if I was worried they would fall apart or shift; I couldn’t rest until their surrounding pieces held them securely in place. As I do with everything, I contemplated how this puzzle compared to life. The Holy Bible has always been the picture on the box for me and each event of my life a piece to the picture. At a very young age, I learned to hold up each piece of my life against God’s Word, studying its pattern, nuance and color to see where it fits in His final image of who I should be. In his letter to the Colossians, the Apostle Paul said that Jesus Christ is the “image of the invisible God.” Paul taught in all the churches he visited that Jesus is the picture of what we should work to create from our lives; that all the pieces of our life should fit together to reflect Him. That being said, I think it is a colossal waste of time to sit and stare only at the shape of an event or circumstance in our life, continually turning it round and round to make it fit with the other pieces in our life without even looking at the big picture to see where it should go. Instead, unless we have great patience, we get frustrated and walk away, leaving the pieces in a pile for someone else to figure out. I realize this may be a simplified metaphor of living a life that pleases God, but I believe that living the life God planned for us is easier than we make it. I believe we complicate the puzzle by refusing to look at the Creator’s final image: His Son, Jesus Christ. Instead of holding up each of our pieces against the model He gave in Jesus’ life on earth, we frustrate ourselves by turning the circumstance round and round, trying to force it to fit where we want it to fit—where it was not created to fit. 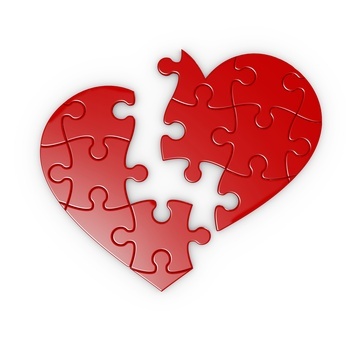 Yes, it’s tempting to get angry and give up when life’s puzzle pieces aren’t traditionally cut; when they don’t fit nicely together the way other puzzle pieces fit. And yes, it’s tempting to look at a piece and think, I know this one doesn’t go with this puzzle. But if it came out of the box, it goes with the puzzle; it’s just a matter of effort and patience to find its place in the big picture. Are you struggling with a piece of your life? Trust me, it fits in God’s final picture for your life. In His sovereignty He allowed it to happen. It has a place somewhere amongst all the other pieces and from His perspective, it’s beautiful. Author’s Note: I dedicate this article to my wonderful Editor, Debbie Adlof, who, over the 14 years she has owned, edited and published the Community Word has become a dear friend. Debbie, thank you for letting me write this column in the Community Word and never once censoring my content, despite the mounting public outcry against God’s Word in public venues. Even if you disagreed with my articles, you never let me know and printed them in full. You have always been wonderful to me, though I have been chronically late with my submissions (even on your last issue!). Thank you for your kindness, respect and friendship. May God bless you richly as you focus your attention on your family and any other pursuits He has for you. Believe me, your puzzle, when complete, will be a beautiful picture God created out of beautiful you! I was home watching President Clinton’s impeachment hearing the day he said that now infamous line, “It depends on what the meaning of the word is, is.” I laughed out loud when, in a desperate attempt to appear innocent, he threw that preposition under the bus hoping it could modify his situation. We sneer and snicker at that ridiculous statement now–in fact, that silly line made it’s way into our lexicon–but are we even aware of the massive damage it did to our society? Watch the news every day for one solid week and you will see that a clear pattern has emerged in our courtrooms of such insane statements. People of all ages, race and gender are tossing out alternative definitions to their wicked behavior. The unbelievable thing is, these new definitions are actually being taken seriously by the courts! Can’t they see that this redefining of our vocabulary is destroying the fabric of our justice system? If all we have to do is stand up in a court of law and simply redefine our actions to excuse our behavior, why do we even need a judge or a judicial system at all? Is there no accountability? If there is no standard in which we measure right and wrong — will we not then destroy ourselves completely? They say, “We will lie to our hearts’ content. Look at the keywords in that chapter: boastful, flattering lips, lie, deceitful, violence, helpless, groans, oppressed, lying generation, wicked . . .
Notice that in this Psalm it states, “The Lord’s promises are pure” What are his promises but his own word? We have a clear, written record of the Lord’s promises — it’s called the Holy Bible. In 1776 the Holy Bible was the standard that our Founding Fathers used to create our justice system. Today, the Holy Bible has been tossed aside, redefined to fit individual conduct. But this insane, incessant redefining hasn’t stopped there. People are redefining our Constitution and its Amendments. Our own president changes the definitions of his words from speech to speech! Our school system is being redefined. Our religious rights are being redefined–even in the military! The definition of our sacred institutions of marriage and parenting are being redefined and maliciously, militantly attacked. Our school system has been redefined. Even our genders are being redefined! The most heinous of all: redefinition has breached the walls of the womb. Life itself–given and ordained only by our Creator–has been called into question by His creation! What does it matter if we redefine when life begins? It matters when that redefinition gives us license to take the life of someone else. It is one thing to simply paraphrase the law–as egregious as that is–but it is altogether damning to have the blood of millions of innocent children on our hands! What have we become, America? What lie from the pit of Hell have we bought that tells us it’s okay to simply rewrite the laws that once governed our country, our states, our communities, our schools and our homes simply because it makes us feel uncomfortable, or hinders us from doing whatever we want to do? How did we get so far off track from our foundational standards? Will you stop right now and pray to God with me? We repent! Wash us clean from our sins! We cannot survive without Your divine intervention. We fall to our knees and repent! Save us O LORD! President Clinton's comment as quoted in this above post. When I was a child, the nightly news seemed like a foreign movie. It seemed that everything evil happened on the other side of the planet, far from our suburban home. When we went to church and heard the Holy Scriptures, sometimes one of those news stories would surface in the sermon and the pastor would use it as an example that God was seriously going to punish those who did evil—but not here in the United States. At least that’s how I interpreted the sermon. After all, we’re all safe here in the good ol’ US of A, right? Sure, we had our crime as any country does, but generally, my view of America was that we are the peacemakers, the humanitarians—the civilized. As Christians, we are called to spread the good news of Jesus Christ across the globe, but the uncivilized, dangerous and evil people were handled by missionaries. These were people specifically called by God to leave the comfort of their American home, travel to a jungle and tell the natives they need Jesus. At home, we would dutifully pray the Lord of the Harvest to send workers to the fields to gather in the lost souls as Jesus told us too—but secretly we’d pray: please, Lord, don’t send me! With the truly sacrificial duties left to the missionaries, we could focus on gossiping and judging each other; arguing about what color the carpeting should be in the new sanctuary and snubbing those who dared to enter our place of worship unkempt. After all, did God not say we must be holy and separate from the world? Now our children kill other children for fun. Our teens set off bombs in our streets. Our junior high boys stock up ammo in their room and bring it to school so they can shoot as many people as possible. How did this happen on our soil? The talking heads have endless theories and solutions, and some of it may indeed help, but those who call Jesus their Lord and Savior can no longer play church. Evil is here, in our homes, our schools, our churches and streets. Evil has come in like a flood and we will quickly drown in it if we don’t pay attention and get on our knees. We can no longer pretend that the bad stuff happens off shore. We can no longer just put a dollar in a church envelope as the offering plate passes by and smugly feel good that we’ve blessed someone somewhere. The ancient book of Isaiah, Chapter 59, practically describes our country word-for-word. Life is bleak and overwhelmingly hopeless and our own sins have brought dark consequences upon us. Justice flees from us; peace eludes us and shedding blood is a sport. What can good people do? We try to live good lives and we give our time and money to help others, so what do we do about all this evil in our beloved country? Many snipe at the government, others snipe at the school system, the justice system, the lack of two parents in the home, etc., etc. Yes, all these are factors in our dilemma, but not one of them alone released this flood of evil into our streets. In fact, none of the solutions we concoct matter in a flood–all that matters is survival, and undoubtedly, a flood of evil is here. It is sweeping away our religious traditions, setting our church buildings on fire and driving us into corners of fear and hopelessness. God will save us, America, but we must fear only Him. We must call upon Him with repentant hearts and pure motives. This flood of evil rushing over our precious land, threatening to devour our families will not prevail if we get on our knees now and call out to the only One Who is mighty to save! The church was never meant to be a building for good people to gather and revel in their goodness while everyone else gets what they get. The church is here to represent the unconditional love of our Savior, Jesus Christ, who loved us so much He chose to pay the penalty of our sin so we could be delivered from evil. What will you choose? Will you drown in the flood of evil, or will you embrace the standard that God raises against it and look to Him for your salvation? If you're being called to write your story for others to read, let's talk. We'll discuss the writing and publishing process and plan your course. I can ghostwrite, edit, coach and manage your book project, but, I'm picky about the topics I work with. If it glorifies God, call me. There's more! Visit my website and click on "SHOP"